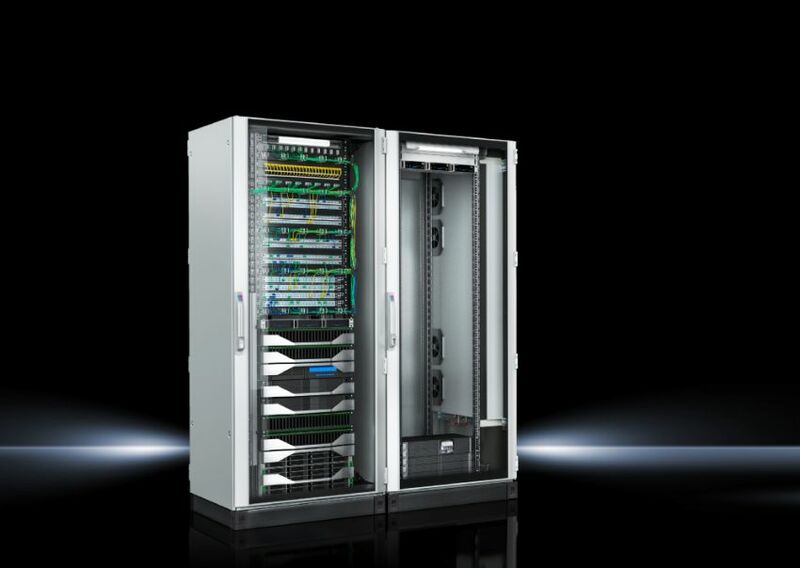 Rittal Edge Data Centres for the Next Generation of Processing and Storage at DCD London 2018 | Rittal - The System. 2018-10-30. There are a number of major trends and technologies which are currently reshaping the IT market and changing the requirements for IT infrastructure. These include the IoT, smart devices, driverless vehicles, cryptocurrency data mining, artificial intelligence, internet shopping, content streaming and online gaming to name but a few. Added to which, there are industry-specific requirements, such as the need for particularly high physical protection in harsh manufacturing environments. For these reasons we are seeing local IT resources - placing computing resources at the perimeter of a given network - to become more widely deployed. This deployment has been dubbed edge computing, and it ensures that latency is low (packet round trips of less than 100ms, with 25ms being desirable), thus making data readily available to a growing number of applications. Edge thereby flips the computing paradigm, pushing computing and data closer to end-users and, in response, IT vendors are developing some innovative solutions which are tailored to sector needs. This rise of edge computing is expected to be rapid and immediate. Gartner, for example, predicts that 50 per cent of all data will be processed in an edge environment by 2022, compared to just 10 per cent today. In its research paper “The Edge will eat the Cloud”, the organisation predicts that the cloud won’t die out, but that its role will shift, and that edge computing will have a massive impact on the IT infrastructure market. The focus for edge is typically on the immediate processing capacity required at the source of data; making it as fast and secure as possible. For example, in “smart” internet grocery distribution centres, robots sensors and actuators continuously relay information on the status of processes and infrastructure. This forms the basis for innovative services such as alerts, predictive maintenance, and machine self-optimisation, delivered by the company’s IT department in real time. For this to happen, and for rapid responses to events and anomalies, it’s critical to have low latency between production and the IT infrastructure. A cloud data centre could struggle to support these scenarios. With all this in mind, many vendors are introducing edge data centre solutions: an end-to-end product with standardised, preconfigured IT infrastructure which can be implemented rapidly and cost-effectively – paving the way for Industry 4.0 applications. Moreover, to safeguard critical components from heat, dust and dirt in industrial environment, it needs to be possible to implement in a self-contained, high-availability room. Some vendors are now combining typical ‘as-a-service’ offerings providing complete, one-stop solutions for those enterprises (regardless of size) that don’t want to manage their own systems. Edge is widely predicted to be transformative in a range of sectors where fast processing speeds of high volumes of data are critical. Examples include manufacturing, financial services, transport and health care. Manufacturing is being transformed by digitalisation and its IT systems need to deliver the many benefits of the increased automation resulting from the use of intelligent robots and networked machines. Similar systems are also being deployed in the hyper-scale internet shopping enterprises which have gained such huge traction in recent years. The systems use sensors to generate continuous data streams, which are then analysed to allow companies to streamline production processes, test and improve product properties, or prepare predictive maintenance scenarios. Issues such as cryptocurrency, blockchain or cashless transactions are triggering innovations in the financial industry. The use of the related new technologies, such as artificial intelligence (AI), call for secure and powerful IT systems. Edge data centres, strategically close to financial service providers, permit the shortest response times and a secure automation of transactions. The IT industry now offers edge and cloud data centres that support all the needs of the financial sector right up to High Performance Computing (HPC). Developments like driverless vehicles, car sharing platforms or intelligent logistics software are changing the way people and goods move from one place to another. The aviation and rail industries are also increasingly digitizing their services to achieve greater efficiency, safety and punctuality. For these and other future applications, companies will need modern IT infrastructures that can process large amounts of data, in real time, locations such as logistics hubs, smart cities, or airports. Edge data centres work well in any decentralised development of IT capacities because they offer the low latency needed for real-time communication between IT systems. Scalable modular data centre (SMDC) solutions can be applied here, typically available in 2, 4, and 6-rack options and delivered as turnkey data centres. Modern healthcare systems today create an intelligent network between pharmacies, hospitals, insurers, and healthcare providers. The patient data stored in this network demands a high level of data availability and maximum protection against unauthorised access. In operating theatres, surgeons must be able to rely on accurate and readily available data, while in diagnostic imaging, it is important to be able to process what could be very large amounts of data quickly at different locations. An edge data centre can handle all this confidential information, delivering high performance levels directly on-site, and ensuring high levels of security. And, as previously indicated, these micro data centres can offer top physical security, including both access and fire protection. To streamline edge data centre planning, many vendors now offer specialised web-based configurators which means compact and small enclosures can now be quickly and easily configured online. Clients can choose the right accessories without reference to a catalogue, then position and prepare the enclosure for mechanical processing. Data-centre-as-a-service (DCaaS) offerings are now a viable alternative for end users who would prefer not to operate the edge data centre themselves. They are then free to focus on their core tasks while harnessing the benefits of the IoT for their business. Hand-in-hand with IT-as-a-service (ITaaS) platform providers, the IT industry also offers private-cloud data centres in shipping containers, plus ITaaS. These containers are fully equipped with all key active components, such as servers, network connectivity and storage for immediate and rapid deployment/use. Edge computing will be a key focus for Rittal who are exhibiting on Stand 19 at DCD London, held at Old Billingsgate from 5-6 November 2018.